We all know that breathing through the nose is quite normal. However, people often asked me whether we should breathe through the mouth or through the nose? The answer is we should only breathe through the nose. The nose is for breathing. The mouth is for what? I always ask them this question, and they always reply the mouth is for talking. This is correct, the mouth is for talking and also for eating. It is not really for breathing, if it was we would have hair inside our mouths to filter out the dust just as we have in our noses. When people are very ill or even dying, they often have their mouths open so they can breathe through it. This is because they are not strong enough to breathe through their noses. The lungs are like a muscle and when people become too weak to breathe properly they will start breathing through their mouths as they find it easier. However, when they breathe like this their Qi will not sink down to their Dantian 丹田. The breath will also be very fast and very short. 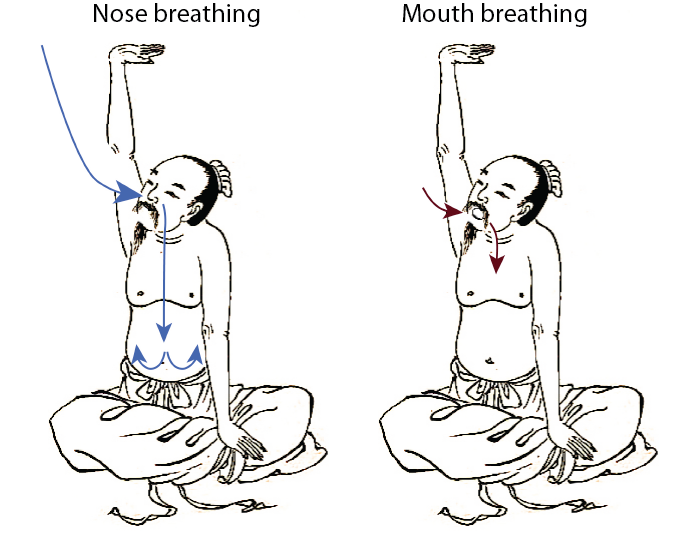 Breathing through the nose allows the breath to be long and deep, then more air will go to the body and the essence of the air is Qi. This will then sink down to the Dantian and this is our life energy. 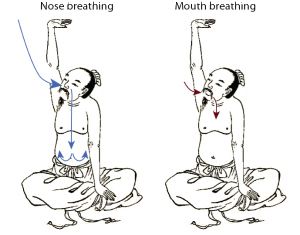 So breathing through the nose is natural. Thank you for your continued teachings Sigong, it is always good to be reminded and learn more.